One more minor update that brings further stability fixes & tweaks. 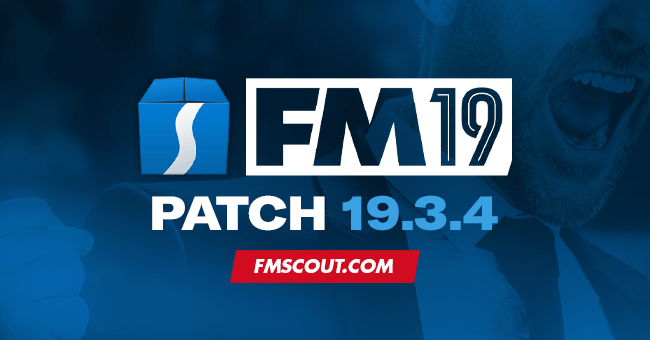 Patch 19.3.4 for the final release of Football Manager 2019. Sports Interactive have just released the twelfth hotfix patch for the final retail version of Football Manager 2019. You can expect further stability fixes and a couple of bug fixes. As usual the update is save game compatible, so you don't have to start a new save game. However, any fixes related to competitions rules or schedules require you to start a new game. To update you will need to close down Football Manager 2019 and re-launch for it to update. If this does not work for you or you feel it has not updated you will need to restart Steam. Even if that doesn't do the trick, then verify the game cache will. If you encounter any issues please do take the time to raise them via the FM2019 bugs official forum. where is the download button for this patch please? since this update Spanish teams are now reverted to original names yet I have done exactly as instructed with regards to deleting the correct files and then adding the files as instructed.